Valentine’s is less than a month away – so I’ve pulled together a quick list of free patterns that are online – quick and easy selection that you can make as a gift or for yourself! Janome has a really sweet wall hanging designed by Jan Spolar. Called “Keep the Heart Truth Growing, it showcases applique and decorative stitching. Full instructions are on the Janome website here. This is an easy paper pieced “postcard” quilt pattern you can make in just a few hours. It’s a free quilt pattern from eQulltpatterns.com. You’ll have to register to download. 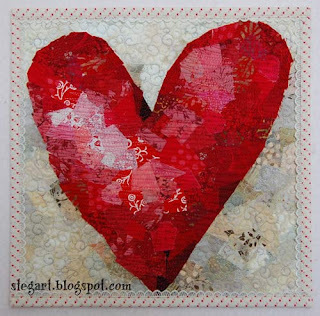 Terry Stegmiller has a wonderful new tutorial for a vibrant and modern heart quilt, you can find HERE. Looking for something a bit different? Check out this heart tree applique pattern called “Heart Tree” by Liz Jones. And if you’re new to applique and need a refresher course, Riley Blake has a tutorial that will help – plus the demo is with hearts! I like the movement found in Sweethearts by Joanie Holton & Melanie Greseth. If you’re a fast sewer there might still be time to make Have a Heart by Nina Lise @ Mrs. Moen Free patterns. Maybe a pillow or two is what you’re looking for? Check out this chenille pillow posted at Craft Passion by Joanne L, website master. Looking for an easy pattern a child could make for a parent? This easy patchwork pillow by Alison of Backstitch Baby is just the thing. And some of us just need candy on Valentine’s Day – and what better way to share the sweetness than candy pillowcases by Jessica Peck of Sweet Pie Bakery! This Candy Heart Pillows are adorable. I’d love to hear from you if you’ve found other patterns to share. This entry was posted in Patterns and tagged applique patterns, free patterns, pillow paterns, Valentine's Day. Bookmark the permalink. Love the Heart Tree applique, but the link takes me to a picture about an inch square, and when I try to enlarge it, it is all blurry! Hi Linda, – try now – I’ve updated the link.